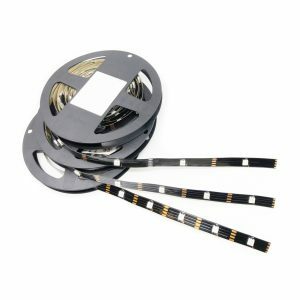 Vertex2 is in pre-order, expected to ship on the 17th JUNE 2019 ! State of the art HDMI central with exclusive output management to accomodate Android TV and similar sink devices doing check while in standby mode. 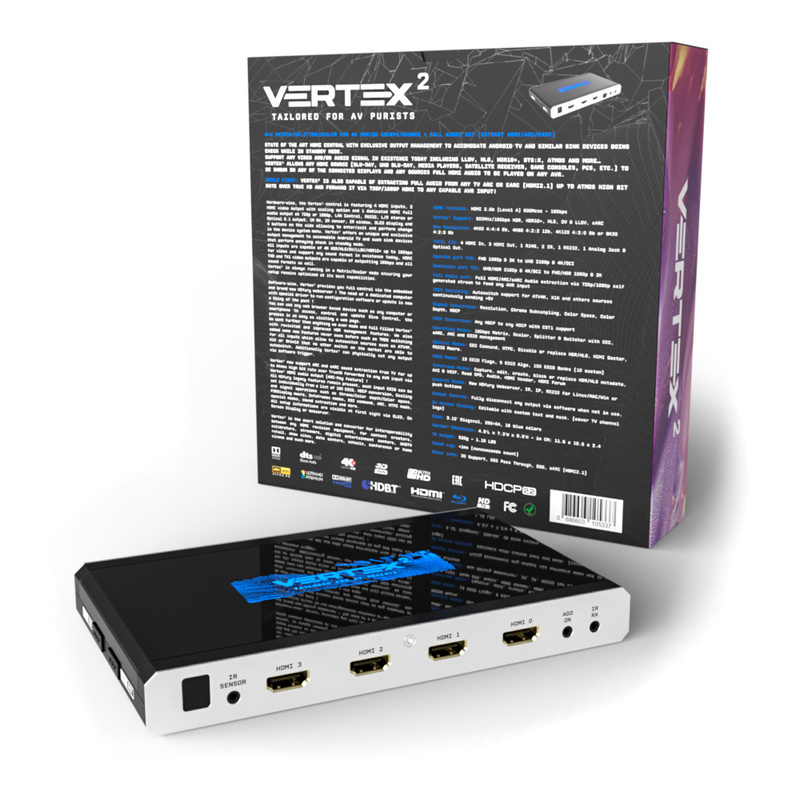 Vertex² allows any HDMI source (Blu-ray, UHD Blu-ray, media players, satellite receiver, game consoles, PCs, etc.) to be shown on any of the connected displays and any sources Full HDMI audio to be played on ANY AVR. World First: Vertex² is also capable of extracting full audio from any TV ARC or eARC (HDMI2.1) up to Atmos High Bit Rate over True HD and forward it via 720p/1080p HDMI to ANY capable AVR input! We are proud to announce the soon availability of Vertex2, successor of the award winning HDfury Vertex and more than ever tailored for AV purists. Hardware-wise, the Vertex² central is featuring 4 HDMI inputs, 2 HDMI video output with scaling option and 1 dedicated HDMI full audio output at 720p or 1080p, LAN Control, RS232, L/R stereo or Optical 5.1 output, IR RX, IR sensor, IR window, OLED display and 4 buttons on the side allowing to enter/exit and perform change in the device system menu. Vertex² offers an unique and exclusive output management to accomodate Android TV and such sink devices that perform annoying check in standby mode. Vertex² is always running in a Matrix/Scaler mode ensuring your setup remains optimized at its best capabilities. 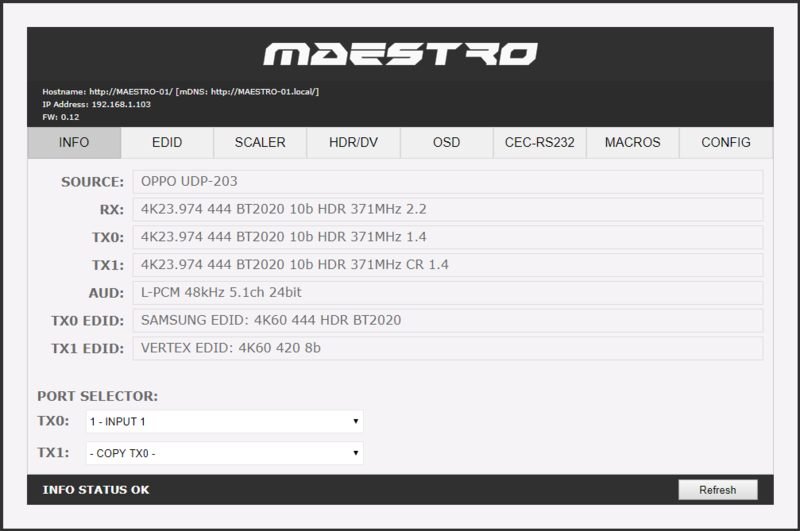 Software-wise, Vertex² provides you full control via the embedded and brand new HDfury webserver ! The need of a dedicated computer with special driver to run configuration software or update is now a thing of the past ! You can use any web browser based device such as any computer or smartphone to access, control and update Vertex² Central, the process is as easy as visiting a web page. We went further than anything we ever made and full filled Vertex² with revisited and improved HDR management features. We also added some new features never seen before such as TMDS switching for all inputs which allow to autoswitch sources such as ATV4K, X1X or Shield that no other switch on the market are able to autoswitch. Additionally Vertex² can physically cut any output via software trigger. World First eARC HDMI2.1 breakthrough: Vertex² now support ARC and eARC sound extraction from TV for up to Atmos high bit rate over TrueHD forwarded to any AVR input via Vertex² HDMI audio output (ARC-Key feature) ! 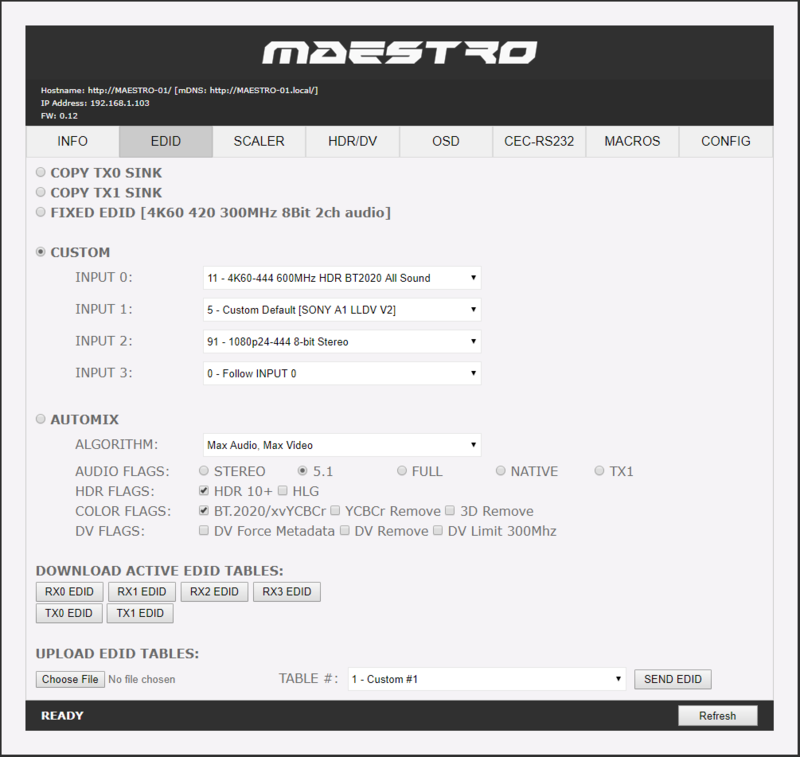 All HDfury legacy features remain present, each input EDID can be set individually from a list of 100 EDID, HDCP conversion, Scaling and signal operations such as Chroma/Color depth/Color space, PJ&Display macro, Infoframes modes, CEC command, ARC, HTPC mode, special modes, sound extraction and more. All setup informations are visible at first sight via OLED, On Screen Display or Webserver. 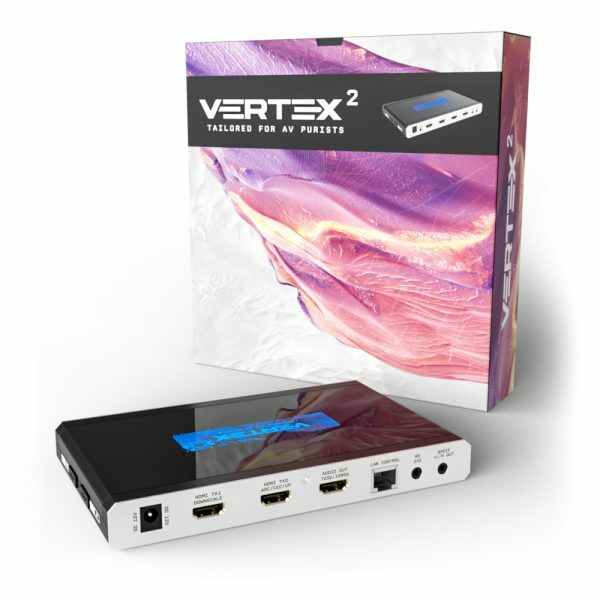 Vertex² is the smart solution and converter for interoperability between any HDMI revision equipment, for content creators, calibrators, streamers, digital entertainment centers, UHDTV retail, show sites, data centers, schools, conference or home cinema and much more. 4 HDMI In, 3 HDMI Out, 1 RJ45, 2 IR, 1 RS232, 1 Analog Jack & Optical Out. 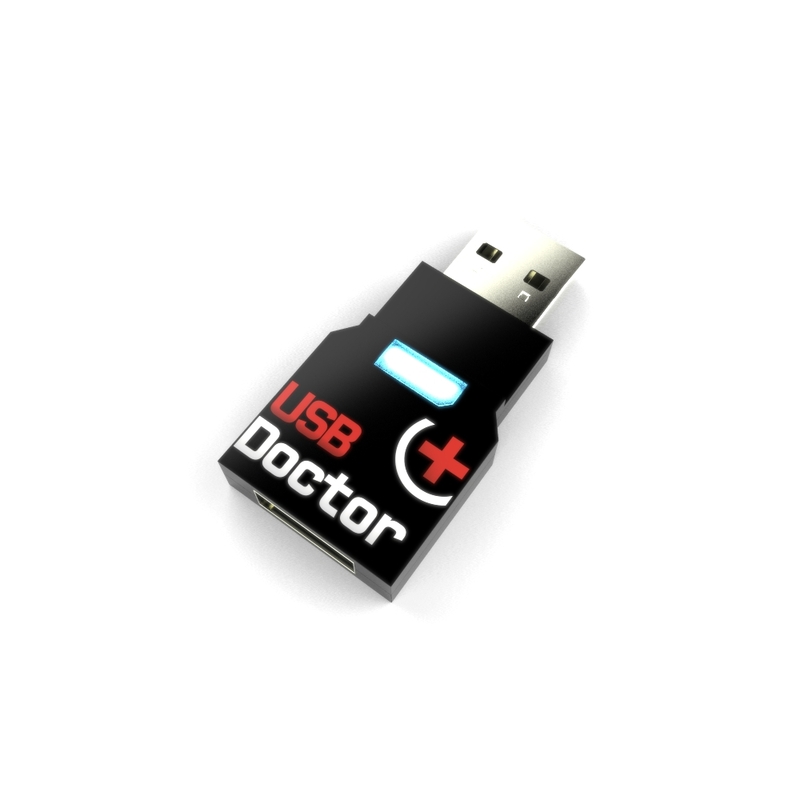 CEC Command, HTPC, Disable or replace HDR/HLG, HDMI Doctor, RS232 Macro. 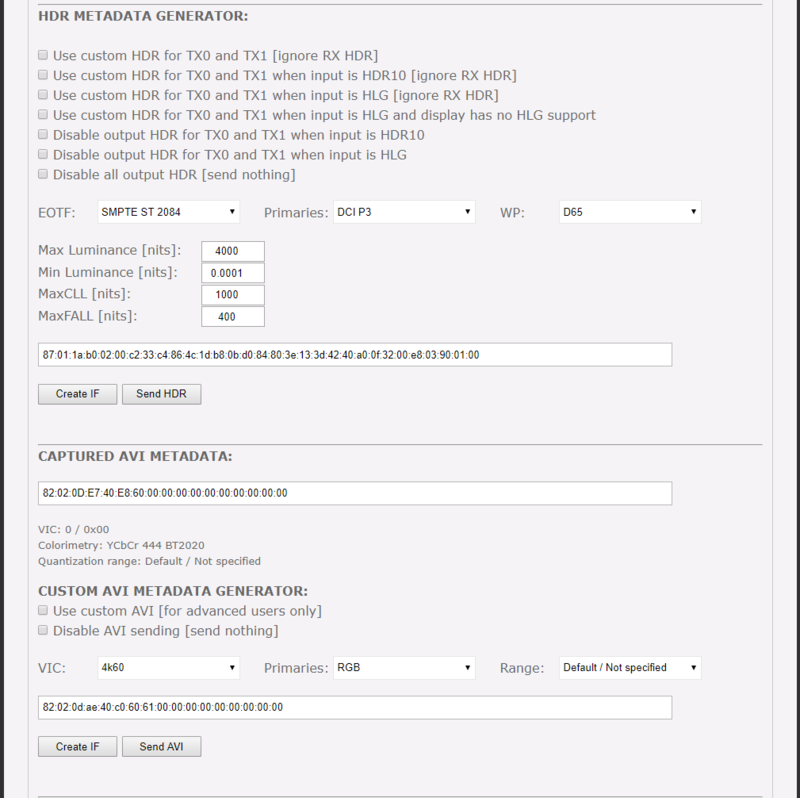 Capture, edit, create, block or replace HDR/HLG metadata, AVI & VSIF. Fully disconnect any output via software when not in use. Vertex² supports any HDMI, HDCP and HDR sources or sink and operate in-between to ensure all your equipment work at their best capabilities. Think it’s complicated? Vertex² can suit any user needs with ease. 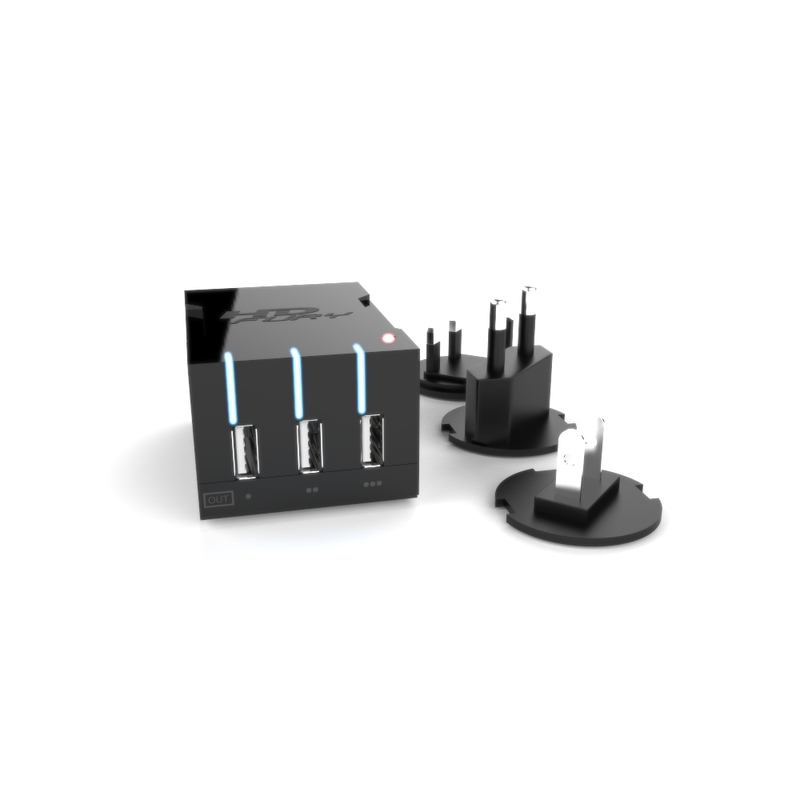 Simply connect sources and sink devices in the right port and add power, Vertex2 does the rest. Get all advantages from HDCP2.2 sources and keep or convert them per channel to suit any HDMI or HDCP sink. Whether it is on OLED, OSD or the brand new HDfury Web server embedded, your setup info is always available at first sight. Control Vertex² using your tablet, smartphone or any web browser based device. Share your config with the community, display any text on OSD, set your start page, remove visually annoying or lamp consuming artifacts like TV channel logo and more. Upscaling from FHD to UHD up to 18Gbps is available to display your 1080p sources at 2160p on your native 4K display. 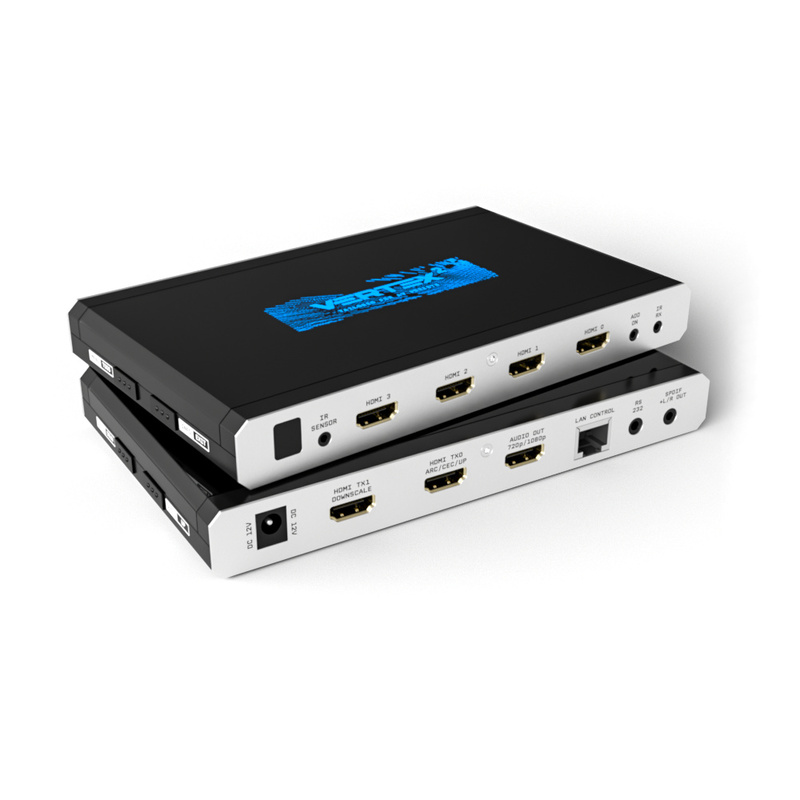 Connect any FHD sink in any UHD setup, play 4K on main stream, and feed your older display, AVR or capture card with a 1080p stream. Any EDID related issues, HTPC issues or HDMI/HDCP handshake, compatibility or revision issues can be solved with Vertex². 1 input replicated to 2 outputs (FHD/HDR-UHD/HDR), each individual output can be used to upscale or downscale based on your setup needs. Vertex² can process two 4K HDR signals up to 18Gbps simultaneously and apply scaling individually per channel. Public HTTP commands access and extensive control to extract, edit, inject or replace HDR metadata, AVI and VSIF Infoframe. Read SPD, Audio, Vendor Specific and more. Vertex² central is featuring 4 HDMI inputs, 2 HDMI video output with scaling option and 1 dedicated HDMI full audio output at 720p or 1080p, LAN Control, RS232, L/R stereo or Optical 5.1 output, IR RX, IR sensor, IR window, OLED display and 4 buttons on the side allowing to enter/exit and perform change in the device system menu. Vertex² offers an unique and exclusive output management to accomodate Android TV and such sink devices that perform annoying check in standby mode. Splitting any signal up to 4K60 4:4:4 600MHz signal is now a reality, thanx to IR/RS232/push buttons or Webserver, you can easily switch between 4 inputs that will be replicated up to 2 outputs for video and 3 outputs for audio (one UHD / one UHD/FHD + HDMI Audio out). HDCP conversion and scaling rules are auto configured and applied on the fly in order to always output the type of video signal and HDCP encryption that your display or sink device is expecting. Matrix solution is available for HDMI stream up to 4K60 4:4:4 8b, 4K60 4:2:2 12b, 4K120 4:2:0 8b or 8K30 4:2:0 8b. Process two 18Gbps signals at the same time from 2 sources to 2 sinks devices and eventually have one of the channel duplicated and converted in res/hdcp/chroma/color depth/color space/etc to a third output + HDMI audio out. Matrix solution is available for HDMI stream up to 4K60 4:4:4 8b, 4K60 4:2:2 12b, 4K120 4:2:0 8b or 8K30 4:2:0 8b. Process two 18Gbps signals at the same time from 2 sources to 2 sinks devices and have one of the channel duplicated and converted in res/hdcp/chroma/color depth/color space/etc to 1080p + a third output with HDMI audio out. Vertex² is capable of injecting and extracting live Infoframe and HDR metadata at any resolution in real time. Decipher incoming HDR/HLG/DV metadata and AVI infoframe, build your own Custom HDR metadata and AVI infoframe thru HDfury metadata and infoframe creator, translate HLG>HDR, replace or boost value from any metadata on the fly or simply disable all or just some of them. Additionally Vertex² also support VSIF, AUD, HVS, HFV and others infoframes. 5 different EDID modes are available: Copy TX0, Copy TX1, Fixed EDID, Custom or Automix. In Automix EDID mode: 13 EDID flags can be forced and mixed thru 5 EDID Algorithms. Vertex² automatically sniff and store DV mandatory string from connected DV capable sink. Always feeding best capabilities HDMI signal to connected sink devices, automatically or manually. No matter if you have HDMI first generation or second generation equipment, any devices always get the best possible signal in FHD(1080p) or UHD(2160p) GUARANTEED. Featuring Upscale, Downscale, Passthru and Bypass mode as well as Chroma Conversion, Color Space and Color Depth modification on the fly at 8, 10, 12 and 16bit for FHD, UHD and DCI 4096x2160p. Each output can be set with individual scaling rules. eARC (for up to Atmos High Bit Rate over True HD) is possible when eARC TV is connected at Vertex² HDMI video output, extracted sounds from TV APPS will be output from Diva HDMI audio output that can feed any AVR input. ARC (for up to DD+/Atmos over DD+ bitstream) is possible from Vertex² HDMI video out. You can select to route this Audio to the HDMI3 (dedicated audio out) to feed any AVR input and/or optical output. Thru a dedicated HDMI Audio output, any HDMI sound format from any incoming signal is automatically extracted and forwarded via a 720p/1080p self-generated stream to feed any AVR input. High end ARC and eARC Audio format from TV apps are output to your AVR input thru the same HDMI Audio output. 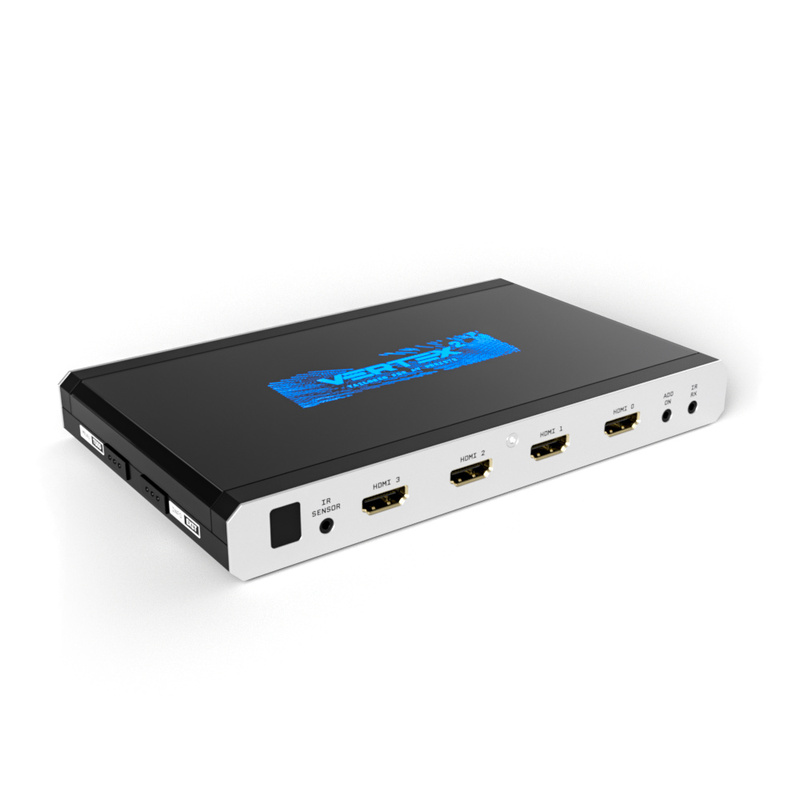 HDfury Vertex² can extract HDMI audio up to 5.1 and pass-thru any sound format in existence today including Atmos and latest via HDMI while downscaling the video for older AVRs, it have a simultaneous output of analog L/R stereo and up to 5.1 optical S/PDIF via 3.5mm combo jack connector. TMDS/pixel clock switching, sole switch in the world capable of autoswitching sources such as ATV4K, X1X, Shield or any others sources devices who keep sending +5v in standby and that no switcher in the world can autoswitch. If you though, like people claim, that we have the best Windows GUI software… Now discover the brand new HDfury Webserver. More powerful with more available options than any Windows GUI we ever did, controlling your HDfury has never been so easy, fast and elegant. 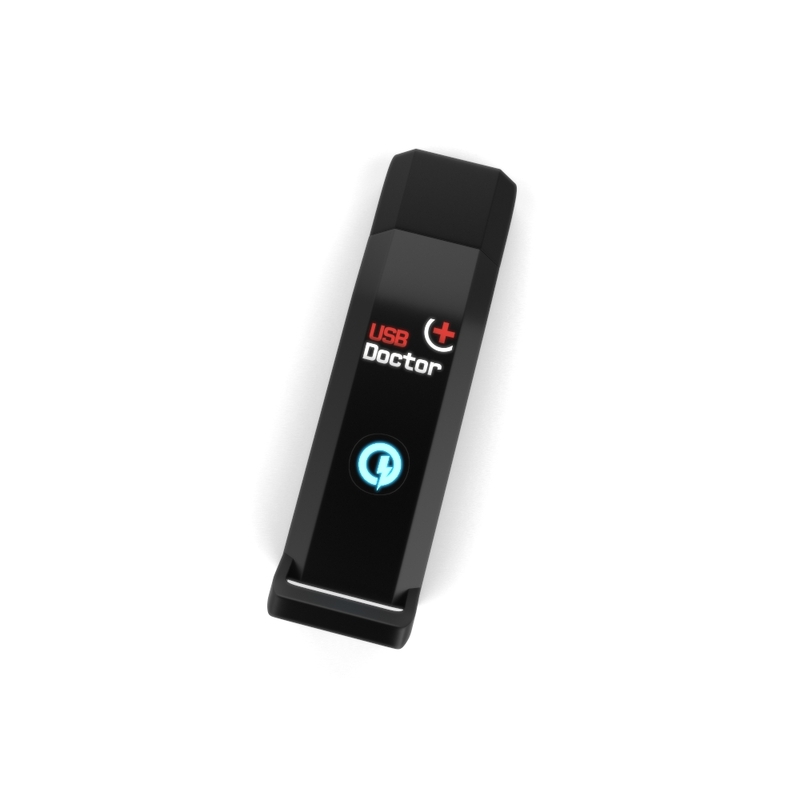 No more driver installation or hassle of any kind, superfast in-system firmware update and wide compatibility with any web browser devices (Mac/Win/Linux/iOS/Android and others). Just type in your Vertex² URL in your browser address bar and start controlling and supervising your setup! Signal and setup info is everywhere and always available at first sight. Enhance your AV knowledge thru exact signal timing report with up to 3 digits decimals accuracy on frame rate. 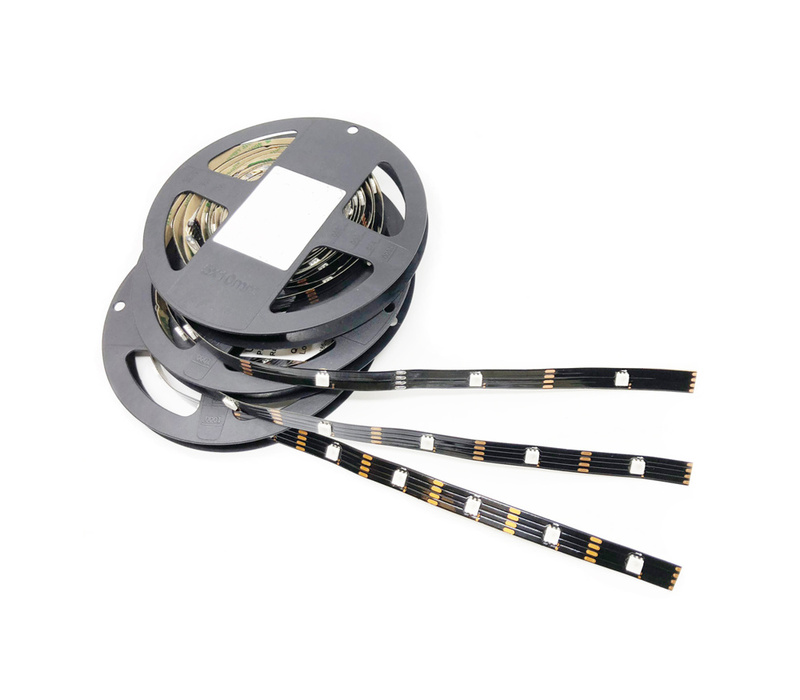 Display source name, resolution, chroma, colordepth, colorspace, hdcp, cst1, VIC, eotf, colorimetry, primaries, white point, max/min lum, maxCLL, maxFall, range and various infoframe (hdr, hlg, dv, spd, aud, hvs, vsi, hfv). 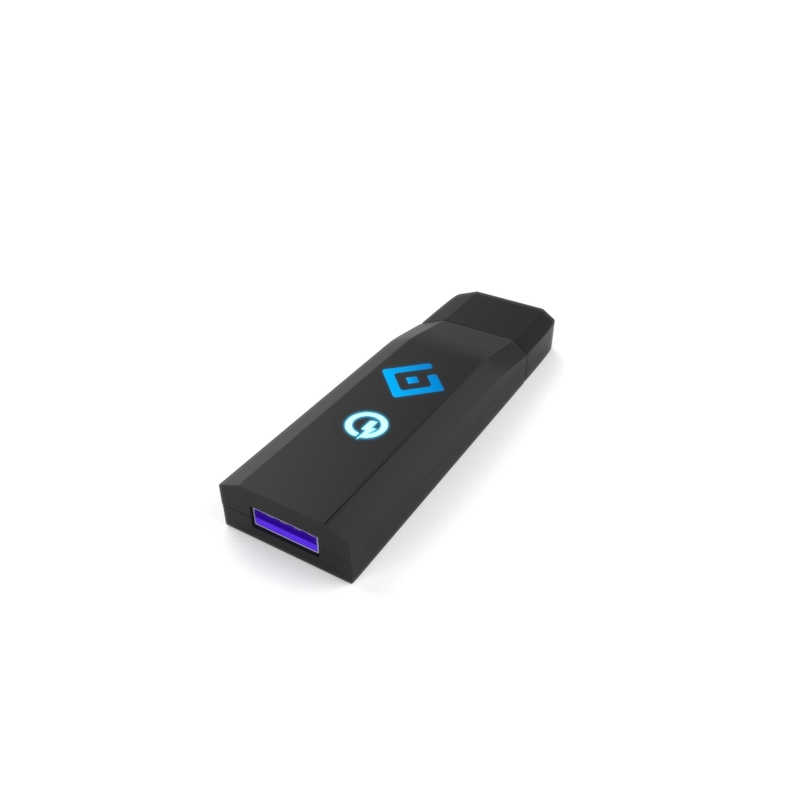 Our new generation hardware is bringing HDMI explorer to another level, simply anything that travel thru is intercepted and exposed to the user via OLED display, On Screen Display or Web server. Initially build for and by the JVC PJ owners community, Vertex² is now capable of sending any custom RS232 commands to any RS232 capable display based on incoming signal types or particular metadata value. Decide which RS232 commands to send to your display when content is 3D, HDR10, SDR BT709, SDR BT2020 and more. All Vertex² controls are also available via RS232 and IP commands in order to ensure a total control from any serial based computer. HDfury Vertex² offers a unique CEC command manager, with CEC compatible equipment. 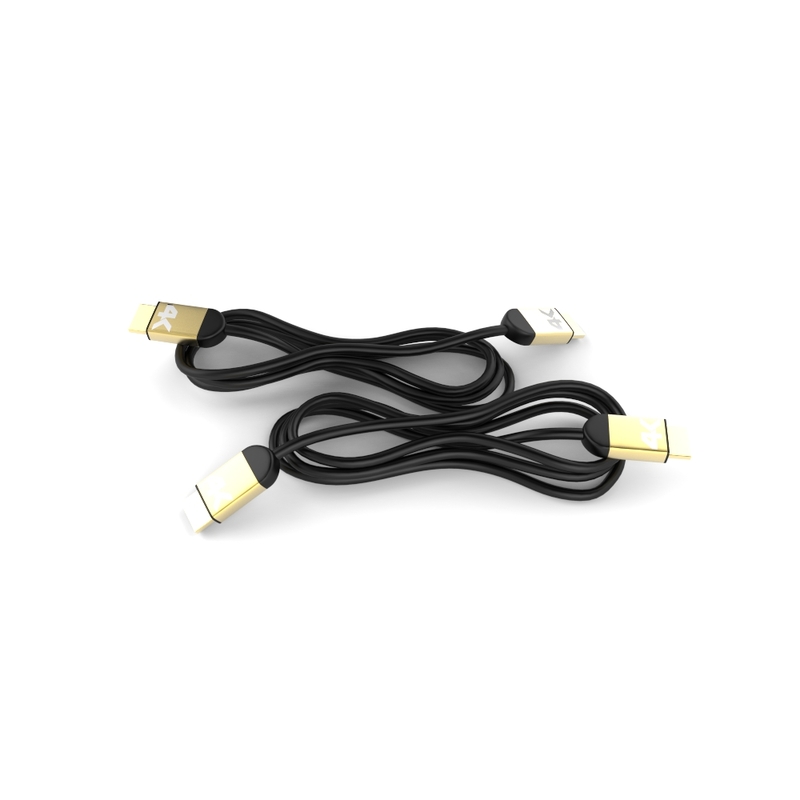 CEC commands allow a HDMI device to send commands to connected HDMI devices. Providing a total of 15 HDCP 1.4 and 2.2 engines for decryption/encryption, HDfury Diva offers a total HDCP workaround solution including HDCP 2.2 > HDCP 1.4 and HDCP 1.4 > HDCP 2.2 both ways conversion within the same unit. 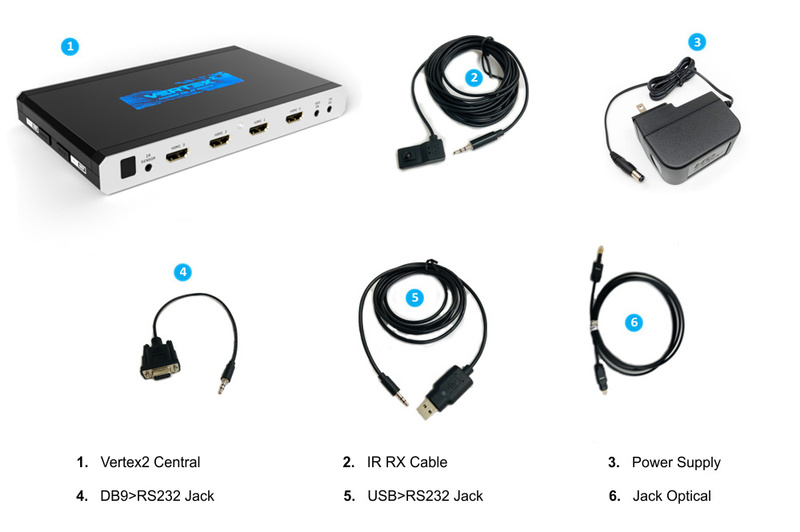 It is capable of connecting any HDCP1.x or HDCP2.x source devices to any HDCP1.x or HDCP 2.x sink devices. Each RX block decrypts the input first whether its 1.x or 2.x. Then each output port can individually encrypts it to 1.4 or 2.2 or not encrypt it at all if it was not encrypted initially. Dual conversion can be operated on all channels simultaneously. HDCP 2.2 is the new copy-protection scheme for 4K UHD content. Source devices, including media servers and head-ends like Netflix, will encode their 4K content with this new scheme. TVs must be HDCP 2.2-enabled to play it, and everything in the video chain including switches and receivers must be compliant as well, or the display will go dark and/or display a HDCP error message. Bad news for consumers who have purchased expensive, high-bandwidth, processor-rich switchers, receivers and displays to accommodate 4K. Once Vertex² is an active part of your setup such issue will not bother you ever again. Below you can appreciate some page views of the embedded webserver in Vertex². All pics were taken from Chrome browser except the last one showing how it looks like on iPhone. Downloads will be available when Vertex² start shipping.